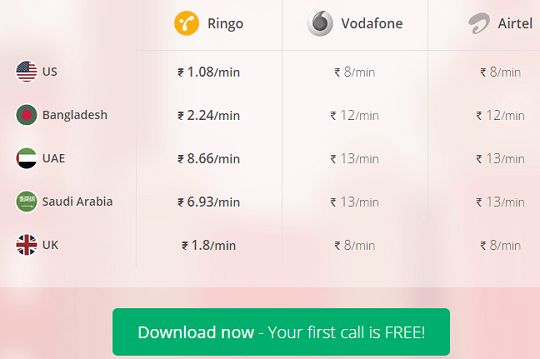 Ringo, the smart international calling app is now available for India. This calling app allows you to call your overseas relatives and friends in cheap rates and without any internet connection. 1. Ringo connects your call via a local number and you don’t need an internet connection. 2. The person you want call doesn’t need to have the app installed. Also, Ringo app is helpful for person’s who don’t like video chat or don’t enjoy being looked at while talking. 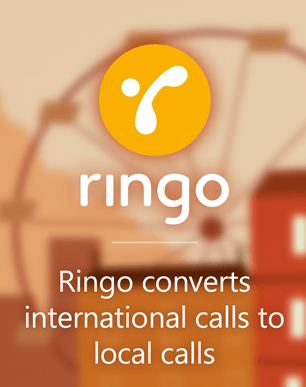 Ringo is free to download (available for Android, iOS and Windows Phone), but you have to pay for international calls, just as you do with Skype. The app connects you to a local phone network and assigns you a local number. It uses undersea cables to send data, bypassing the need for internet or mobile data. Ringo app was launched in May 2014 and already successful in about 16 countries (including Australia, Hong Kong, Singapore, USA and UK,) , now it’s reached to India and Indian users can utilise the app for making international (ISD) calls at lower rates. For instance with Ringo you can call a person in US at Rs 1.08 per minute, where as major telecoms in India like Airtel or Vodafone will charge you at Rs 8 per minute. Also, this internet-free calling app provides cheaper call rates when compared to popular VOIP services such as Skype and Viber. For instance Skype will charge Rs 1.45 per minute for calls to USA and additionally you have to pay for data charges. So, if you want save money on ISD calls then Ringo is the must have app on your mobile devices whether it’s a Android or iOS or Windows Phone. To find our more about charges visit www.ringo.co website, where you can know how much a call will cost and you can buy credits on the website to add to the apps wallet, the minimum recharge starts from Rs. 25. Also, the first call you make with the app to anywhere in the world, is free. Download Ringo at Google play/ AppStore/ Windows store. Note: After installing the app, you need to verify your mobile number and the app will call a number, the verification message is around 15 seconds. This call will be charged according to your mobile tariff plan, for me it was around 35 paise.